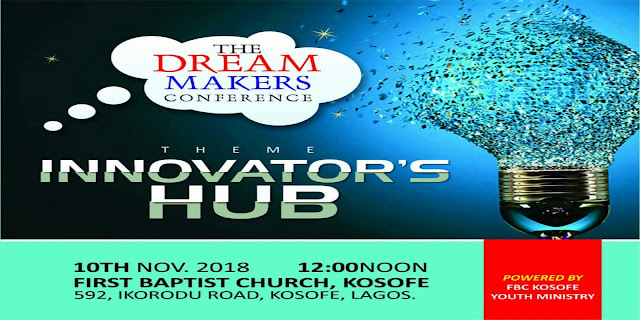 The Dream makers Conference (TDC) is a brainchild of the Youth Ministry of First Baptist Church, Kosofe. The vision of the Conference is to build youths who know who they are, what they have and are ready to take their rightful place in every aspect of human endeavour. This annual Conference started in 2015 with the theme: "The Dream Makers and Their Dream." The focal aim was to sow the entrepreneurship seed into youths. It is our belief that if youths can conceive a dream, by training the dream can be nurtured to greatness. In 2016, we jumped off the bed of dreaming and leapt to “Riding on Your Imaginations." The focus of the 2016 Conference was to encourage youths not just to dream but to also learn how to painstakingly start, grow and maintain their business dreams. In 2017, we set out to blaze our dreams in “Dreamblazers." The focus was to create a generation of youths that know how to shine and illuminate the multifaceted gifts God has deposited in them. It is discovered that we should not be limited to merely having or blazing the dream we have, but there is a need to actualise this dream by connecting and learning from great minds and their success stories. The Innovators Hub is further designed to serve as an avenue for innovators who are ready to make the best use of every opportunity around them and achieve their dreams. The Hub is to build people-ideas who are primed to influence their marketplace for God. Our aim is not circumscribed to only the business and career landscape but also the political and international scene. Our speakers are recognized speakers, who have the experience and wherewithal to unearth the secrets of success to us. Venue: First Baptist Church, Kosofe, Mile 12, Lagos State.